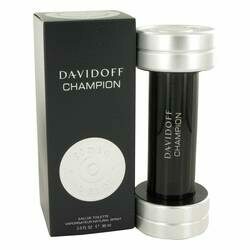 Davidoff Champion Cologne by Davidoff, Davidhoff champion came onto the scene in 2010 and has been popular ever since. The bottle that this eau de toilette is packaged in is very unique. It is shaped like a dumbbell – a symbol of strength and masculinity. The perfume itself is strong too and has a personality of its own. Wearers will notice the use of citrusy accords as well as woodsy notes. The top notes are lemon and bergamot. The middle notes are clary sage and galbanum. Lastly, the bottom notes are cedar and oak moss. The overall tone of the perfume is sporty. One can expect a lot of athletic men to be enticed by this product.